I am going to explain the EXACT same thing I did on the Purse Scavenger Hunt instruction page. If you end up going over there for a visit, you will fnd the first couple paragraphs are the same as here. But you will also find the instructions on how to play. 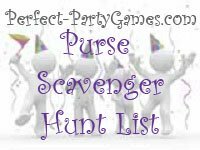 I had the best time coming up with this Purse Scavenger Hunt list. I first performed my own purse scavenger hunt to see what I could find. Since my purse is rather small, I only found the usual faire. So I began to branch out. I called my sisters and asked what THEY had. Then I called several nieces and girl friends and asked them to take a peek in their purse. The list I was gathering kept getting longer and funnier by each phone call. So the items you find here are made up of REAL items found in REAL purses. I couldn't have made this stuff up if I tried! Some of the items are regional. For instance, my niece had just returned from a trip to Disneyland and was still carrying her Disney Dollars. The articles range from the mundane to the exotic. This game is great to play at a bridal shower. Looking in the purses of the brides maids gives you a chance to find out who they really are! Another fun way to use this activity is at a women's retreat. It couldn't be easier to plan the entertainment where your guests bring the game without even knowing it.If you're in college and all your friends carry backpacks, simply add a few "school specific" items and have a blast with your roommates. While using this idea the next time you get together with your girlfriends, be sure to add a few more items you think some of YOUR friends would carry. Remember to add some "regional specific" items to the purse scavenger hunt list. You might want to add some "seasonal specific" items as well. An example might be to add wool gloves if it's snowing or sunscreen if it's summer.